Here you’ll see a list of truly best LaTeX resume and CV templates. You’ll no longer have to browse hundreds of other LaTeX templates for resumes and CVs available online, not knowing if what you see is what you’ll get. Resume experts at Zety have tested each LaTeX resume template on this list to make sure you get the best of the best. A collection of LaTeX resume templates better than 9 out of 10 other resumes. Links to all LaTeX resume/CV templates so you can download and edit them for FREE. Examples of the best LaTeX templates for resumes and CVs from all over the Internet. Our top picks of LaTeX resume templates—professional, academic, and creative. The pros and cons of writing your CV in LaTeX. LaTeX gives you much more control over your resume formatting than MS Word, or open source word processors. There's a large number of nice LaTeX CV templates on Reddit, GitHub, and StackExchange available for free. You don't always have to install TeX editors on your computer. There are free online LaTeX editors that offer a wide variety of document templates, including for CVs or resumes. So, what are the shortcomings? Resumes are living documents, especially when you’re actively job-hunting. LaTeX works best for documents whose formatting doesn’t change much and often (books, dissertations, etc.). Once you choose a template for your LaTeX resume/CV, you’ll be pretty much stuck with it. If you decide to try a new one, you’ll have to do everything from scratch. With table-based documents, speed is not LaTeX’s best friend. Changing a two-column format into a single-column one will require you to create your resume from scratch. You’ll also waste more time than you should on rearranging the sections to switch between functional, combination, and chronological resume formats. Not all formatting works seamlessly. The most popular LaTeX resume generators can take you by surprise when you try to upload and crop a picture, for example. Some online LaTeX editors have problems compiling PDFs, or your connection might get timed out pretty often if you’re not using the premium version. Some LaTeX resume/CV templates have beautiful infographic-inspired elements that are almost certain to fail the ATS scan. So, be careful when choosing those creative LaTeX resume templates. Note: All templates available in our builder are 100% machine-readable and ATS friendly. There’s no denying LaTeX should be your text editor of choice if you’re publishing research with mathematical equations, indices, bibliographies, or cross-references. For CV writing purposes using LaTeX may be a bit like using a hovercraft to cross a puddle. This LaTeX resume template is both simple and effective. It’s easily navigable, minimal, and makes great use of white space and modern typography. Large headings and horizontal lines neatly divide it into sections. A great pick for freshers and candidates with limited professional experience. You can edit it online for free here. 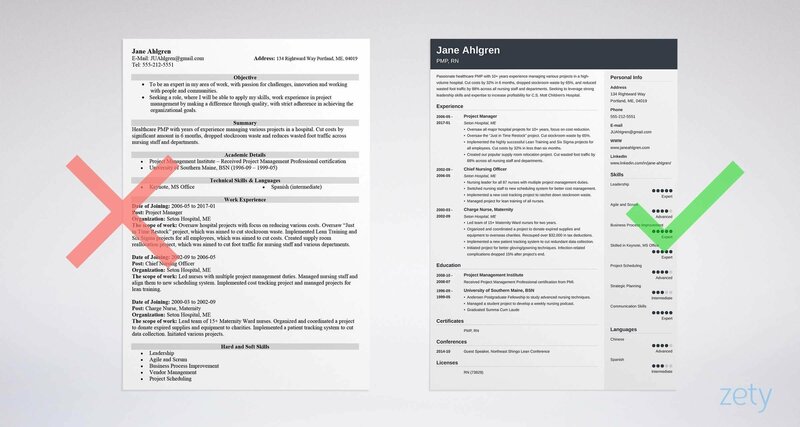 Pro Tip: Want to see what your resume would look like if you used a different template? In our resume builder, it's a matter of a single click! Just a pick a template you like, and your entire content will be copied automatically. If Marissa Mayer was looking for a job, her resume would look just like that. 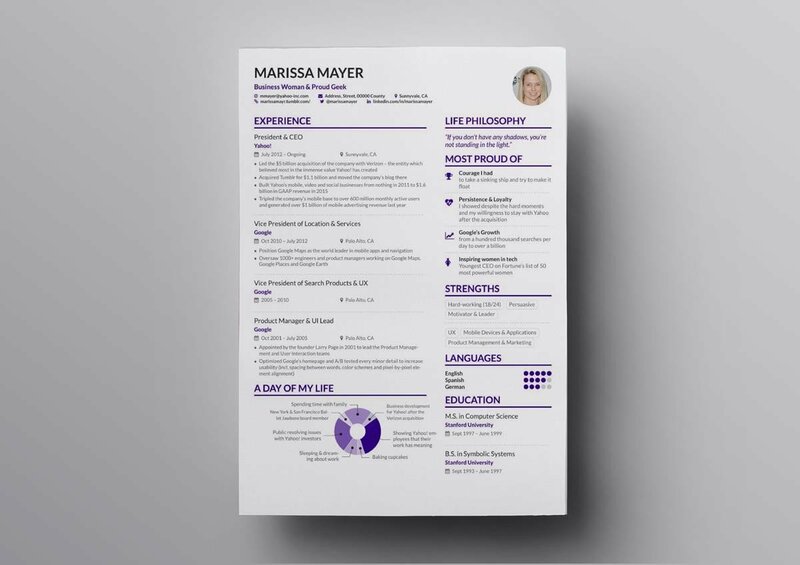 This LaTeX resume template is perfect for seasoned pros with bags of experience. 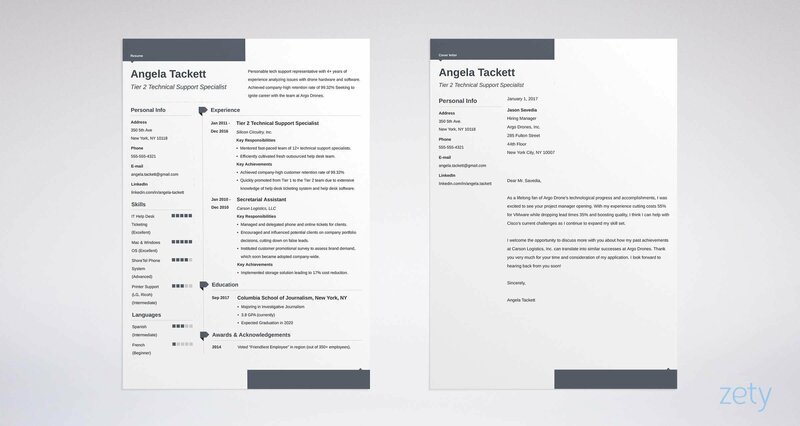 Thanks to its two-column resume layout it can hold a lot of stuff and won’t look crammed in the least. Plus, it’s super stylish and created with attention to the tiniest detail. 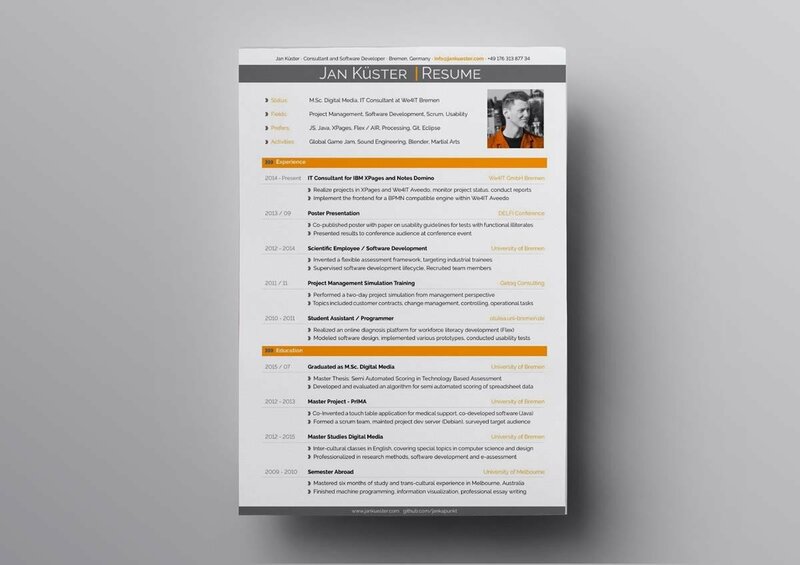 This slick LaTeX resume template by Jan Kuester is an excellent choice for newbies and experienced professionals alike. Each section and subsection is nicely delineated with a set of harmoniously looking graphic elements. Thanks to the use of bullet points and varying font weights you can instantly focus on the important stuff. Its modern look gives it an irresistible appeal. You can edit it online for free here using LaTeX resume generator. If simplicity is the ultimate sophistication, then this LaTeX resume/CV template is sophistication in the flesh. Its clean design, modern typography, customizable colors and sections turn it into a perfect academic resume template in LaTeX. However, thanks to its flexibility and malleability it can cater for the needs of job seekers as well. It’s suitable for, say, fresh computer science graduates, and those at the beginning of their career paths. It’s one of those LaTeX resume templates that stand out from the crowd. Designwise, it’s a modern-looking two-column resume, which means you can put quite a lot there and it won’t look cluttered. It’s nicely divided into fully customizable sections. Plus, you can grade your skills on a visual scale. The template’s default layout is perfect for academics, but with a little bit of tweaking any job seeker can use it to their advantage. What immediately distinguishes this LaTeX resume template is typography. Sans-serif headers in combination with a serif typeface in section bodies work tremendously well. The template is easy to navigate thanks to horizontal lines that divide each section. This LaTeX resume template is great for all those who’d like to bring their employment history and professional achievements to the fore. Originally conceived as a LaTeX resume template for software engineers, this template is very versatile. As such it will appeal to experienced professionals and rookies alike. 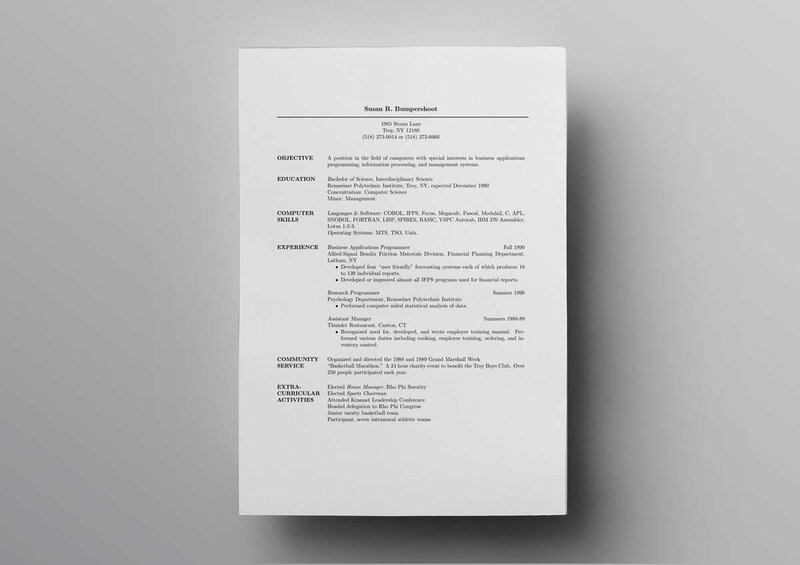 With some minor adjustments, it can turn into a great student resume template in LaTeX. Thanks to its two-column layout, each section is easily identifiable and the entire resume comes across as very reader-friendly. Visit the website if you don’t have the required LaTeX packages. One of our favorites, this professional LaTeX resume template is super elegant and clean. The balance between white space and content is close to perfect. It’s nicely divided into easily-navigable sections. Fonts are simple and readable. It’s only one-page long, but thanks to its well-thought-out layout you can fit in a lot of information. Plus, the delicate frame along the margins gives it an extremely stylish look. Great for all job seekers at any stage of their professional careers. This one was originally created as an academic resume/CV template in LaTeX. Will work great for you if you've graduated from, say, Stanford and want to highlight your academic achievements. 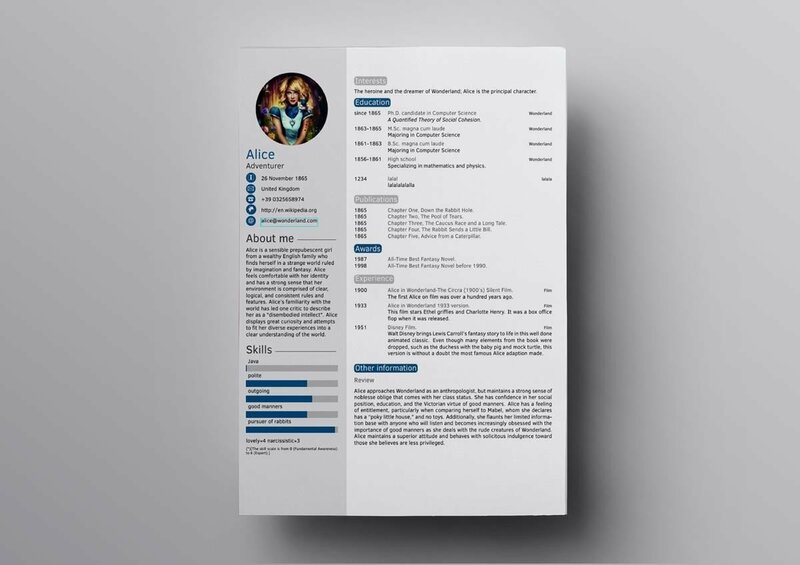 But with some modifications, it can easily transform into a very attractive resume template for job seekers of all sorts. It’s easy to navigate, reader-friendly, and well-organized. If any LaTeX resume template was ever to go viral, it would be Deedy’s resume. And, truth be told, it did. This simple two-column LaTeX resume template took Reddit by storm back in 2014, and proved a sensation on Github repo. It’s not surprising, though. This LaTeX resume/CV template for a software engineer is easily scannable, uses simple yet effective fonts, and is beautifully laid out. Great for any job seeker at any stage of their professional career. You can edit it online for free here or here. Visit the website to learn more about the author. 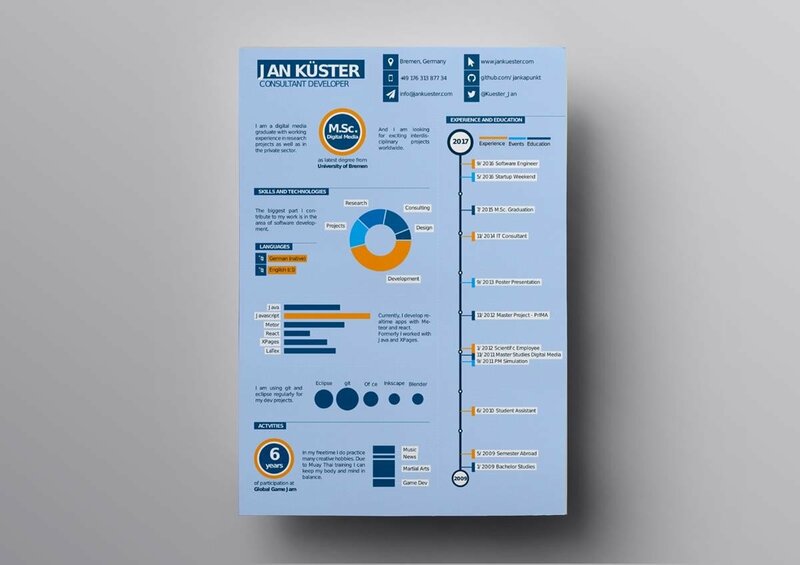 If you want to impress the recruiter with a creative and original LaTeX resume template, there’s no better option than Jan Kuester’s infographic template. It’s very well planned and laid out. It’s one of those LaTeX resume templates that turn reading a resume into a pure, unadulterated pleasure. The only problem with this creative LaTeX resume template is that any ATS will be having serious problems parsing it. So, make sure you send it in an email straight to the recruiter or hiring manager. This LaTeX resume template is part of a free resume bundle consisting of as many as six LaTeX resume/CV templates. You can download the full bundle for free from here. If you dig deep enough, you will find some really good looking LaTeX resume templates. Most of them are freely available CV/resume LaTeX templates with standard MIT license. They are all easily editable, either online on using free desktop apps such as Texmaker (Win, Mac, Linux). A word of warning: not all online resources are fully functional. You may bump into corrupted .tex files or galleries of non-editable PDFs with no corresponding LaTeX resume templates available. Choosing the best LaTeX template for your resume is just the first step. You must be sure your resume delivers. Found other LaTeX resume/CV templates you think could be a nice addition to our selection? Do get in touch, and we’ll be happy to put them on the list! Any issues with using LaTeX resume templates? Reach out to us in the comments below, we’ll get back to you! Modern resume design for the modern day resume. See creative samples and follow our guide to make the best modern resume that will land you the job.